Maxi Health Research® is proud to provide you with our delicious tasting Omega Yums 1000™. The fish oil is encapsulated in a kosher, vegetarian soft gel, suitable for children, which can be chewed, punctured for the oil, or swallowed whole. It easy to digest and has no aftertaste. Omega Yums 1000™ comes in a delicious Fruity Burst flavor that your children will love. You will want to make sure your children have this wonderful support while under your care. Don’t forget to take it for yourself while you are at it. You don't have to be a kid to love Omega Yums 1000™. Try it - you'll see! Other Ingredients: Gel Shell (cornstarch, carrageenan, vegetable glycerin, purified water, stevia leaf extract), mixed tocopherols, natural fruit flavors. My kids take Omega Yums. They love the taste. I have a boy, very active. He has a problem sitting still in class. Since he started taking the Omega Yums he began to concentrate in his learning. This made him relaxed more. His teacher sees a big difference. Our three year old had very little and dry hair. A friend suggested that we try Maxi Health Omega Yums. After taking it for one week we saw her hair getting thicker and shinier. Thank you Maxi Health! Our 3-year-old sister had very little and very dry hair. A friend suggested we try Maxi Omega Yums. After taking it for one week our sister's hair became thicker and shiny. When friends and family asked us what we did to her hair Omega 3 is the answer. Every winter I use to get dry skin and tiny warts. 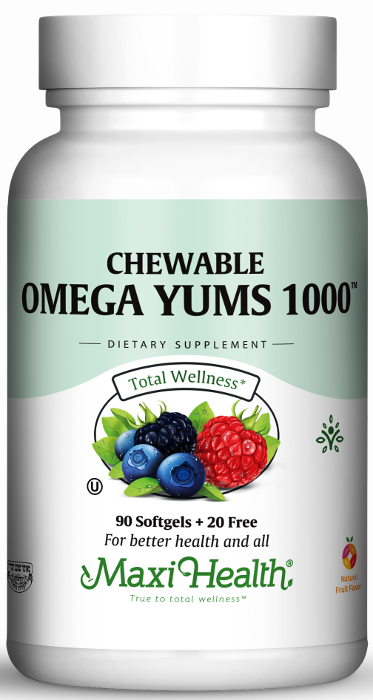 I took chewable Omega Yums. My skin is now fine and I no longer get the warts! I am taking Omega Yums and my health is much better! About a year ago my mother gave me Omega Yums. It helped me improve my concentration at school. Thank you for making these excellent vitamins and supplements! I am 13 years old and I had fluid in my ears. I tried Omega Yums and now I don't have the problem with fluid. My son is in a main stream cheddar. He was really falling behind. Family members suggested Maxi Omega Yums!. The results were amazing. He was not only able to stay in his class but keeps up with everyone else. Thanks so much.